The winner of BBC2’s Great Chelsea Garden Challenge – the amateur garden designer whose garden was built at the RHS Chelsea Flower Show – was revealed in the run-up to the show as Sean Murray. Sean, 51, is an occupational therapist and nurse who lives with his wife Eileen and 21-year-old daughter Ellen in Northumberland. He was chosen from hundreds of entrants to become one of six would-be designers who were mentored by Joe Swift of BBC2's Gardeners' World. The participants had only four days and a limited budget to build show gardens in different styles – including cottage gardens, formal gardens and conceptual gardens – in order to impress RHS Judge James Alexander Sinclair and Gold medal-winning garden designer Ann-Marie Powell. The prize was the opportunity to create a Show Feature at Chelsea inspired by the RHS Greening Grey Britain campaign. The would-be designers were judged on how well they met the brief, their horticultural knowledge, design skill and their garden’s sense of theatre. 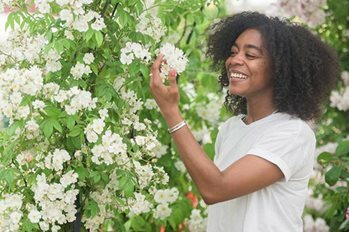 The BBC’s Great Chelsea Garden Challenge competition was filmed at gardens across the country, including RHS Garden Harlow Carr, while the finale took place at RHS Garden Wisley. One of Sean’s earliest memories is sending off to a local newspaper for a six-seed starter pack, for which he still has the newspaper cutting. His first article for his school magazine explained how to disbud a show chrysanthemum, much to the amusement of the rest of his class. Sean is completely self-taught and has no formal garden training. He is also a self-taught flower designer and recently passed his NAFAS (National Association of Flower Arrangement Societies) demonstrator's test. The RHS briefed Sean to design a front garden for the RHS Chelsea Flower Show, incorporating parking and plants as part of the charity’s new campaign to get Greening Grey Britain. As many of the UK’s front gardens are paved over for parking, the RHS wanted Sean to design a garden that would demonstrate how you can have space to park a car, but that it is also possible, and important, to incorporate plants within a front garden. Sean's design incorporated gravel with naturalised planting and he kept hard surfacing to a minimum, due to its associated impact on local flooding and rising temperatures. The ebb and flow of a water-filled crevice divided the garden, symbolising the flooding and draining of the earth. Reclaimed materials were included to complement the slate dry stone walling and paving. Nooks and crannies were created to support nesting and overwintering habitats for wildlife. Secluded seating was situated beneath a tree canopy, while a tapestry of shrubs, perennials and scented climbers was interwoven with annuals and bulbs, providing year-round interest from leaf texture, form and changing colour.